Hillhead always puts on a fantastic show and this year was no exception – 2018 will be remembered as being a bit special, namely due to a spell of hot weather that made the venue feel more like the Sahara than an East Midlands quarry. It was also a bit special for Kinshofer UK. The crane and excavator attachment expert, based in Stockport, has enjoyed a successful year across the board and its presence at Hillhead went a good way to reflect this – showcasing a wide range of quarrying, recycling, rehandling, demolition, and construction attachments. 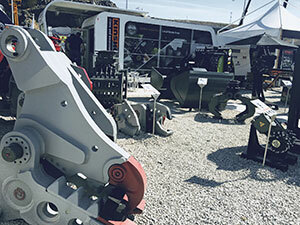 Andy Little, Kinshofer UK Excavator Attachments National Sales Manager, looks back at some of the highlights from one of the busiest shows of its kind in the UK. What was the strategy for Kinshofer at Hillhead this year? Fundamentally, we set out to showcase Kinshofer’s global strength and expertise. It’s something we feel sets us apart in the marketplace and we really wanted to bring it to Hillhead for the benefit of our UK customers and local dealer network. Our regular UK sales team was joined by a significant number of global contributors, to offer expert advice and insight. Our global CEO was present along with product managers from all the major teams based in Germany, as well as leading representatives from our partners in Holland, Sweden, New Zealand, and Australia. Allied to this was a strong showing from our national dealer network to add further local knowledge for the benefit of our customers – MTK, Mutleys, Dunrave, Yarwoods, Fitzgeralds, and Hodge Plant were among those represented. What products took centre stage? Undoubtedly, the transverse drum cutter set-up with NOX Tiltrotator and OilQuick hydraulic quick change was a real focus – not just because of its relevance in terms of application but also because of its sheer flexibility and multi-tasking potential. We did see a large amount of interest in it, as the ability to pick up and drop off attachments from the cab is a massive time saver for any operator, and the NOX added to the flexibility story nicely through its cylinderless capability. Our traditional demolition range from Demarec proved popular as always, this year complemented by the smaller DMS Multi-Shears with exchangeable jaw sets. Among other products, we featured a selection of the twin D-Lock quick couplers and tilt couplers, the largest HPXdrive clamshell bucket, the C40HPX, suitable for 40t excavators, and the FlipScreen screening and recycling bucket generated a lot of interest too, as it’s a simple idea beautifully executed – all displaying the breadth and expertise Kinshofer brings to the UK market. And what were the main messages? As a business, our main aim is to consistently develop innovative product ranges that build a reputation for quality, reliability and safety – with a customer-centric approach that focuses on after-sales support. The NOX gaining Product Acceptance status from Network Rail was an important development for the show this year. Becoming rail ready was the culmination of a lot of time and effort from all parties concerned in the approvals process, and this firmly demonstrates the productivity gains that innovative technology can bring to the rail sector. You also had a demo machine present, how did this fit in? Yes, courtesy of Dunrave Plant Services, we ran a 9-tonne Wacker Neuson ET90 at the Registration Demonstration Area, which demonstrated a TR10 cylinderless NOX-Tiltrotator and an assortment of hitches, buckets, and other attachments. Steady crowds were a consistent feature of the three days, despite the heat up at the top. They were able to see our ‘Slim As The Dipper’ routine – a neat little demo that simulated a narrow trench – which showcased the NOX’s slim profile and ability to work unimpeded in confined areas due to its lack of cylinders. How did 2018 compare to previous years? Having attended the last eleven shows at Hillhead, I can safely say this was one of the best, if not the best, show I can remember at the quarry. Bigger investment, better organisation, record audience numbers, better customer feedback. And weather like no other! Was the show successful for you as a business? Having a strong product story certainly helped generate interest, pre-show discussion, on-stand attendance and ultimately helped to drive sales. Relationships were strengthened with existing customers as they always are, and plenty of new relationships were formed this year also. Hillhead number twelve was all about sun cream, ice cream, and some selling in-between! This entry was posted in Featured, News and tagged Crane Attachments, Excavator Attachments. Bookmark the permalink.